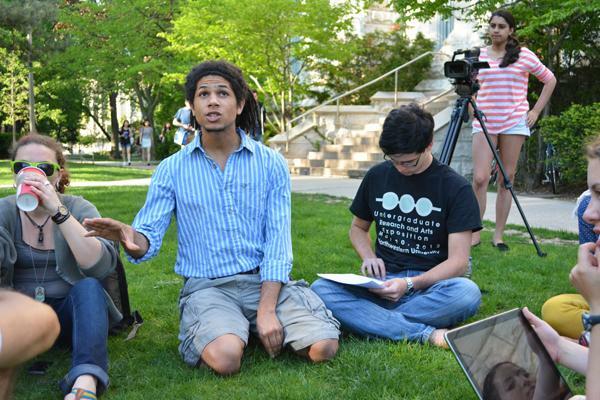 Weinberg senior Noah Charles speaks Tuesday afternoon at the People’s Gathering on the lawn by The Rock. Spearheaded by about 20 students, the event aimed to demonstrate the use of public space for positive change. Students and community members discussed race and diversity problems Tuesday in a free-form demonstration, encouraging attendees to take a stand for what they believe in. People’s Gathering, an unstructured protest event organized to give students the opportunity to use public space for productive change, drew about 45 people who came and went throughout the two-hour discussion. Sitting in a large circle in the grass outside University Hall, students discussed issues ranging from Dinesh D’Souza’s controversial remarks at an event Monday to the framing of the Israeli-Palestinian conflict by campus groups. Weinberg senior Noah Charles spoke about his reaction to the decision by NU College Republicans to bring D’Souza to campus. He said after reading the first few pages of D’Souza’s book, he had never been so deeply offended by a piece of writing. The discussion transitioned to address contention that had developed around the Israeli-Palestinian conflict, touching on tensions between pro-Israel and pro-Palestinian groups, as well as student media coverage of Social Justice Week. Conversations also centered on how open NU as a community is to different points of view. Several students pointed out that willingness to engage people with differing opinions is key to making progress, although others suggested that the best way to achieve a true collective conversation is to be disruptive. Students transitioned during the course of the event from discussing issues that have offended them to talking about what they’d like to see change at NU. Weinberg sophomore Moira Geary, an organizer of the event, said it was intended to encourage students to fight for social justice. Correction: A previous version of this story misidentified Darien Wendell’s grade. Wendell is a freshman. The Daily regrets the error.